In 2018, The Dakuwaqa Project has pledged to install five murals in cities around the globe, each unveiled with a local celebration to raise maximum awareness of the environmental issues portrayed. To make this possible, we need your support. Together, we can make our communities—and by extension, our planet—more beautiful and sustainable for years to come. Public art is transformational. It transcends culture and language. It stands out and beautifies mundane spaces and is available to all. 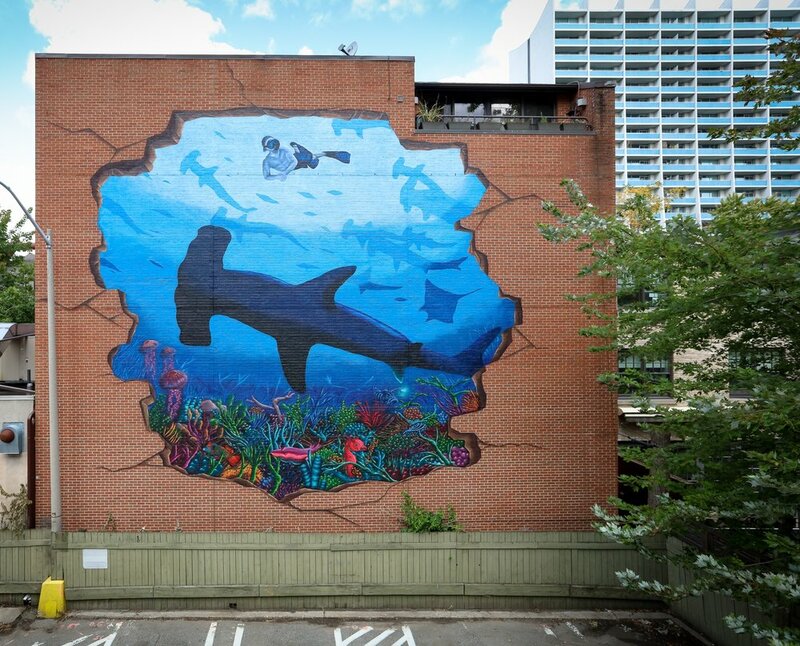 Through murals we can remind urbanites of the natural world that supports us —so long as we take the steps to protect it. PangeaSeed’s SeaWalls program uses public art to translate facts into visual stories that increase awareness and cause action. Since the program's inception in 2014, PangeaSeed has created nearly 300 murals in 12 countries across the globe. The Dakuwaqa Project is an extension of this movement, dedicated to ensuring Rob Stewart’s legacy not only lives on, but continues to grow. See what The Dakuwaqa Project has done so far. Depending on the size of a wall and the permits required, a single mural can cost up to $10,000. This includes paint, equipment, permits, and production costs such as travel, food, and lodging for artists that are donating their time*. The live event is also an important component, as it provides a platform from which to inspire continued action towards saving the planet and humankind from a seemingly inevitable and unfortunate fate. At a minimum, events require donations in the form of venue, audio/visual equipment, refreshments, entertainment, and/or funding. In total, we expect to require $15,000 per activation in the form of donations or sponsorship. * When possible, we will offer a steipend to the artists for their contribution as this is an important element in sustaining a creative economy.